I've spent some time setting up Debian Squeeze (Debian6-19-04-2012) on my RPi. Of course, I know that this little RPi with a 700 MHz processor and just 256MB of RAM can never be a power machine. However, I was interested to see exactly how far could I bring it to get a better handle on its shortcomings. As I already posted, I've tried three OSes on my RPi so far, and IMO Debian is by far the most advanced of them. See the screenshot to see how it looks for me. As you can see, I have a fairly advanced version of Conky running including weather forecast and Gmail updates. In addition, on boot I autologin to my own account and go straight to the Desktop without having to startx. Additionally, I changed the keyboard layout from the default GB. I'll post shortly what I did to get these things working. On the downside, the RPi is definitely CPU-challenged. In my case the usage rarely goes below about 65% and about 40% of RAM is in use even at idle (although, of course, Conky, the lxpanel and Xorg are always running). Browsing is slow at best and Gmail only works in the basic-HTML mode. While shell-fm works fine, it doesn't seem to tolerate doing anything else while it's running otherwise the sound stops even though, apparently, the music keeps playing. I posted to the RPi forum on this but received no replies. In addition, it seems even having Conky running will switch off the sound after no more than one minute (possibly because of Conky's frequent updates). Another problem I've seen is that while I can send files to the RPi (using scp) from a remote computer and use the remote to copy from the RPi, I cannot seem to ssh connect from the RPi to a remore computer which seems weird. 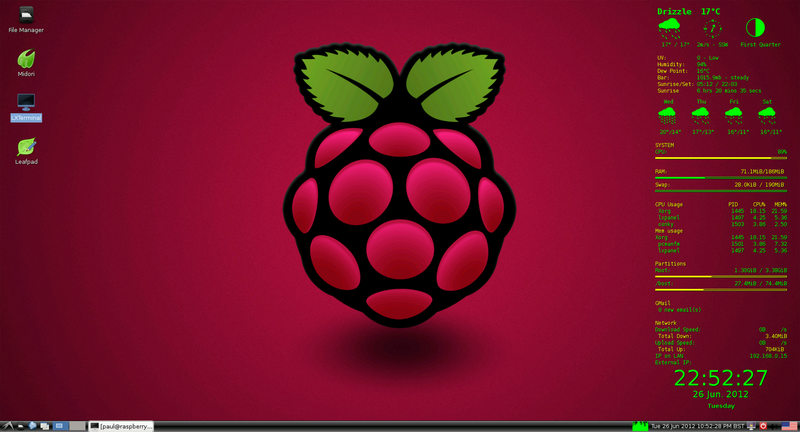 Incidentally, I got the nice 3D Raspberry Pi wallpaper from DeviantArt.